We fell in love with the uniqueness of this 'modern meets rustic' kitchen. From the brick backsplash to the walnut countertops, we were dying to know what interior designer Linda Mazur's inspiration was for this gorgeous space, and we have a feeling you might be too! 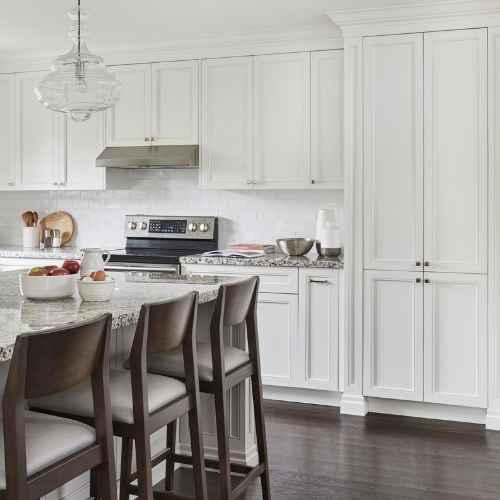 The following Q&A takes us behind this kitchen design and into the thought process of the talented Linda Mazur. My clients love to travel through the European countryside, primarily Tuscany and Florence. They really wanted to have a bit of the old rustic feel reminiscent of kitchens they have seen throughout their travels; while still maintaining the modern, streamlined and functional aspects of today’s kitchen spaces. They also entertain quite a lot, so it was extremely important to them that they have a space where friends can gather and enjoy a glass of wine while they prepare a meal. Yes, we had a few challenges with this space, and went through several different designs before settling on this one. We were originally working with a narrow, long sub-division kitchen with an eat-in area. We were looking to remove the adjacent wall leading to their family room to create a large integrated kitchen and living space which would have been great for entertaining. However, we had a few structural and mechanical issues involved with the removal of that particular wall that made it not a feasible option for my clients within their given budget. Instead we decided to proceed with opening up that wall approximately 8’ which gave a feel of a more open concept and integrated space, and allowed for the area we needed to design this wonderfully large center island that my clients really wanted. We also needed to ensure we had enough cabinetry and storage for our clients, which was tricky in this space as the remainder of the wall space to the right of microwave is all lost to windows and a walk-out. I love to design kitchens, like bathrooms, they often go through such a dramatic change when renovated. I enjoy the challenge of creating a functional, timeless space for my clients. It’s important for me when designing a kitchen that the space is efficient, comfortable and has a good flow. It should reflect current trends but not be exclusive to it. It’s important to delivery on a client’s “wish-list” however, it’s equally important to have a clear understanding of their day to day needs and living style to ensure that the two work together well. The floor is a great porcelain tile, 20” x 20” in size that amazingly resembles polished concrete. I loved the feel of texture and patina that it evokes, reminiscent of many of the old worn floors found in the European countryside. We had the tile installed with a seamless transition to the hardwood in the adjacent rooms. Personally, I prefer doing seamless floor transitions it’s much more of a custom finish and also, when there is nothing interrupting the transition between two types of flooring it often can trick the eye in to feeling the space is larger. The large island provides for them a great, uninterrupted work surface which was key. We relocated the plumbing, both the sink and dishwasher to the island, this allowed us to maximize the cabinetry on the wall, and also be able to have the space for a larger fridge. All the cabinets are outfitted with space saving storage solutions maximizing their efficiency. We were able to give them enough counter space between the fridge and slide-in range to allow for another workstation should they both be cooking together; and there’s a comfortable amount of open space around the island for they both of them to be working at the same time, while still having guests sitting at the island. I didn’t want to design an all-white kitchen for this space, it’s a very bright room with lots of natural light that can handle more color and texture. I wanted to design a space for my clients that incorporated that old “Tuscan” feel they were looking for. Many of these European kitchens have wonderfully eclectic pieces like old painted hutches, or an old painted farmhouse table with wood top. They sometimes have beautiful old hand-painted tiles, or vintage stone or brick walls. I wanted to design a space that incorporated these influences. The island was our primary focal point as it was designed as a space to gather around and socialize. That said, the deep charcoal color definitely made it stand out in this kitchen, and it complimented the walnut counter top and reclaimed brick backsplash beautifully. The kitchen space has a great rustic vibe to it, but it still has a modern feel. I love the cantilevered walnut counter top on the island. The color blends well with the rest of the house and the fact that there are no legs at the island definitely makes for a more modern touch. The texture and old-world aspect of the floor and faux reclaimed brick back-splash add a nice charm to this kitchen. There really isn’t one specific thing. They love the walnut counter and the size of the island I’ve been told is perfect for entertaining, exactly what they wanted. The function of the kitchen has been wonderful for them as well, very easy for two cooks to work in here at the same time. And, I know they just love the tiles, both the floor and backsplash, the texture and vintage feel definitely evokes for them memories of the Tuscan countryside they loved so much. Linda is a graduate of the University of Western Ontario, and started her entrepreneurial adventure in 1998. Pursuing design throughout her career in several different creative forms has given her a far-reaching knowledge and understanding of the field. 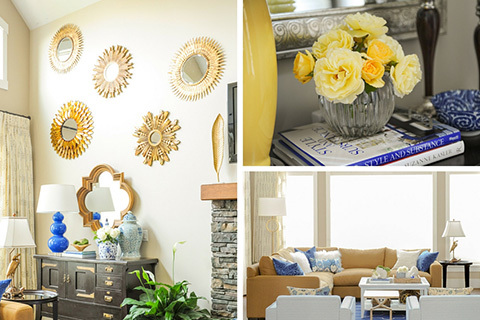 Linda believes that good design should be timeless yet adapt to the needs of her clients. Her approach to design is a classic style blended with a bit of the unexpected, creating comfortable, functional and livable environments reflecting her client’s own individuality and personality. She has a positive, caring energy that puts her clients at ease throughout the renovation process…whether the project is large or small, they know she truly cares and loves what she does. Linda has taken her passion for art and design and transformed it into the career it is today. In the media Linda contributes as an “Ask the Expert” designer at the National Home Show, and is a regular columnist in Condo Life Magazine, The Toronto Sun and various other publications. She supports various charities that are personal to her such as ALS, Sick Kids Hospital and The Canadian Red Cross. To learn more about Linda and view her design portfolio, please visit www.lindamazurdesign.com.